Pop culture rarely makes space for the middle. Works that last beyond their initial airing, release, or printing are shuffled into “best of” lists and mocked in “worst ever” discussions, with everything that falls between the extremes championed by a small but passionate minority. Hit the streets on Halloween night and you’re bound to encounter dozens of costumed revelers extending the legacies of Superman or Spider-Man into the early 21st century—but you’re not likely to see anyone in, say, Damage Control garb outside the halls of a comic convention. It’s that impulse to hold up and indulge “the best” that, to my mind, makes us want to see cultural titans, fictional and factual, come together and inhabit the same world—despite the frequently disappointing results of such partnerships. It’s a sum-of-its-parts-is-greater-than-the-whole proposition. Yeah, Traveling Wilburys’ “Handle With Care” is a catchy little number, but is it really any better than anything Bob Dylan, George Harrison, Jeff Lynne, Roy Orbison, or Tom Petty wrote and recorded on their own? (“Don’t forget session drummer Jim Keltner!” say fans of Keltner’s work on various Randy Newman LPs.) Of course not, much in the same way that Universal’s Frankenstein Meets The Wolf Man tops neither the studio’s original Frankenstein nor Lon Chaney Jr.’s initial outing as an accursed lycanthrope. Besides, when it comes to monsters whose stories have been told and retold dozens of times, the line between terrifying and hilarious is razor-thin. Hence Mad Monster Party, Hotel Transylvania, and The Halloween That Almost Wasn’t, a 1979 TV special that, among its many scattered aims, asks why “the world’s most famous monsters” have lost their capacity to scare in the decades (and, sometimes, centuries) since they were conceived. Playing out in the long shadow of Young Frankenstein, the special answers its own question: Just as Halloween traditions were forged from rituals and ceremonies meant to ward off evil spirits, things that once went “bump” in the dark of the movie theater eventually become beloved cultural icons, sources of more joy than terror. Also known as The Night Dracula Saved The World (this despite the fact that it’s the fate of a holiday, not the planet, that’s at stake—not to mention that the count does precious little “saving”), The Halloween That Almost Wasn’t casts Judd Hirsch in the role of Bram Stoker’s famed creature of the night. 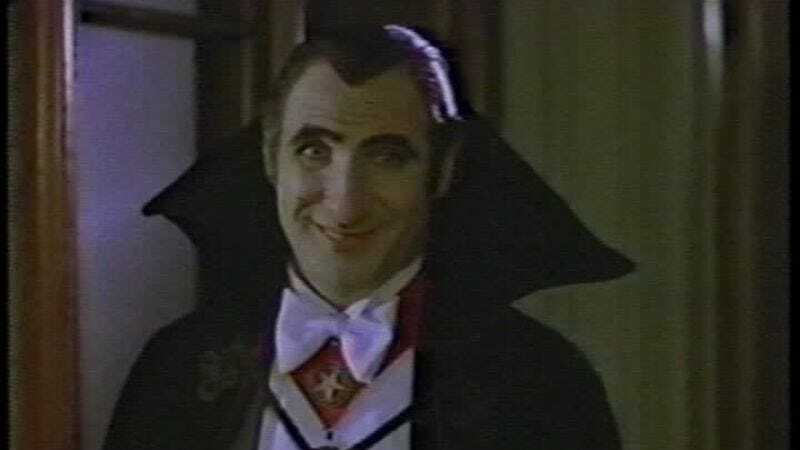 That’s an early sign that the special has no real intention of reversing Drac’s claim that his fellow monsters have sacrificed their monsterhood; Hirsch acquitted himself as a fine dramatic actor before and after The Halloween That Almost Wasn’t, but at the time he put on Bela Lugosi’s accent and widow’s peak, he was busy comically regretting Alex Reiger’s life decisions on Taxi. Hirsch’s Dracula even carries some of Alex’s world-weariness into the Transylvanian twilight, making the character out to be a temperamental grouch who only wants to keep his place at the top of the monster chain of command, and maintain a shred of Halloween’s essential spookiness. Or is that what he wants? Belying its secondary purpose as a framing device around which Kenner could get a jump on Christmas sales of radio-controlled R2-D2s and Betty Crocker Juicer-Blenders, The Halloween That Almost Wasn’t isn’t the most logically sound seasonal offering. 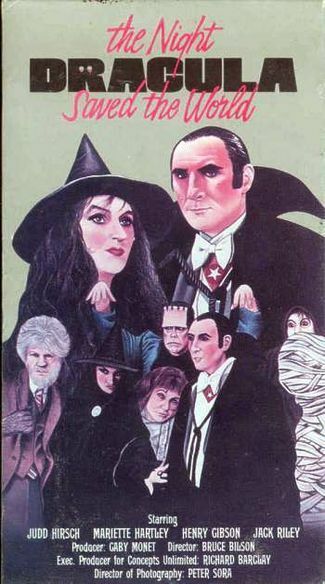 The assembled creatures—including Dracula, Winnie The Witch (Mariette Hartley in an Emmy-nominated performance), Warren The Werewolf (Bob Newhart Show regular Jack Riley), and Frankenstein’s monster (John Schuck, who’d draw on his experience here to play Herman in the first failed attempt at reviving The Munsters)—are described as “the leaders of the monster world,” but what that means isn’t discussed beyond their invitation to the summit at Castle Dracula. The topic of the summit: A rumored cancellation of Halloween, eventually revealed to be a negotiating tool in a power play by Winnie, who, as we all know, initiates the holiday every year with her customary midnight ride across the face of the moon. Somehow, this fact manages to slip through the History of Halloween lectures given by the special’s Greek chorus, a local Transylvanian family that is introduced while they prepare to celebrate their own All Hallow’s Eve (a term I would’ve learned much later in life if the Disney Channel hadn’t rerun The Halloween That Almost Wasn’t on an annual basis in the ’90s). The family’s unnamed moppets are the characters who should ultimately receive credit for salvaging Halloween and its traditions, though The Night That Girl Dressed As A Witch And Her Brother In The Scarecrow Outfit Persuaded An Actual Witch To Not Be So Selfish wouldn’t pop on the lime-green background of a VHS cover. There’s a lot of hash to be made of the special’s low-budget special effects and era-specific kitsch: Like the multiple writers who took a crack at Hotel Transylvania, comedy lifer Coleman Jacoby determined the only satisfying punctuation for The Halloween That Almost Wasn’t was a dance sequence. But Jacoby, director Bruce Bilson (Summer Roberts’ grandpa! ), and their cast and crew weren’t aiming to make something that could stand up with the works of James Whale and Tod Browning; they were crafting a fun, fitfully funny device to fill the half-hour between Halloween Is Grinch Night and a new Mork & Mindy, one laced with a tiny bit of learnin’ about why the members of the special’s target audience don costumes and ask their neighbors for candy every October 31. And if that provided the chance for a handful of television regulars—let us not forget Henry “The head Nazi from The Blues Brothers” Gibson as a perfectly put-upon Igor—the chance to ham it up at their own personal costume party, where’s the harm in that? There’s a mercenary angle to the timing and sponsorship of the special’s original broadcast, and Bilson did only what’s absolutely necessary to portray a single New York mansion as two separate castles, but no one onscreen trudges through their performance—unless they’re playing a mummy or a zombie, that is. There are enough rough edges of The Halloween That Almost Wasn’t that it’s difficult to argue that the special ought to be dragged out from the tomb of lost Halloween specials. But its heart is in the right place. By 1979, the holiday had become the source of much hand-wringing—concerns over unsafe children’s costumes had been parodied by Irwin Mainway and the “Invisible Pedestrian” two years before; three years prior to that saw the murder case that stoked urban legends about mass poisoning of trick-or-treat candy for decades—and The Halloween That Almost Wasn’t works to assert the rich, long-standing customs and ultimate harmlessness of a holiday that, like so many other gatherings held at this time of year, simply bring people together to celebrate another successful trip around the sun. To neutralize the real-world (and occasionally justified) scares that were springing up around Halloween, a witch needed to become less wicked and Dracula had to lose some of his bite. The Halloween That Almost Wasn’t is successful in building its supernatural Mount Rushmore, even if that monument to monster-movie tropes and the maintenance of Halloween traditions doesn’t stand as tall as other autumnal offerings like It’s The Great Pumpkin, Charlie Brown or Halloween Is Grinch Night. Out of the broadcast rotation for years and living on mostly in YouTube embeds, it’s destined to be a holiday custom championed only by the few. That’s a fitting fate, considering that it’s the quietest, smallest band of characters that eventually comes to the rescue at the end of The Halloween That Almost Wasn’t. So long as the special maintains a following, Winnie The Witch will still take that regular flight, right on schedule—and if the members of that following know what that flight’s significance is supposed to be, maybe they’ll fill the rest of us in on the secret.